One bite of these awesome chocolate souffle shots and your sweetie’s heart will melt. Honestly I don’t know why we have not made a chocolate souffle recipe yet. Perhaps we were waiting for John’s souffle recipe to do it, lol!! John sent us this recipe via our facebook recipe contest and it won us over. Chocolate Souffle is ideal for date night. Make ahead and bake off when ready. 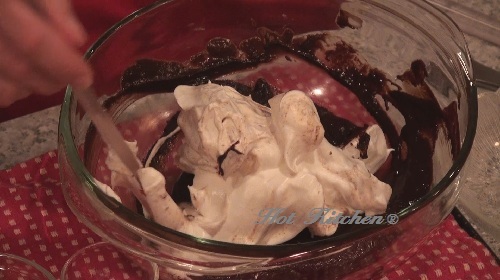 Warm, gooey, chocolatey….yummmmmm! We had a little fun with this awesome souffle recipe! Instead of using traditional souffle dishes, we baked them up in shot glasses. Then we finished them with a little drizzle of coffee cream liqueur. The result is the perfect, spoonable, bite sized dessert. A nice side effect of the shot glasses is that the souffle barely collapses. Use 1 tablespoon of the butter to grease one 16-ounce or two 8-ounce ramekins (Hot Kitchen Touch: 8 1 oz tempered glass shot glasses). Coat the ramekins with the cocoa, tapping out the excess. 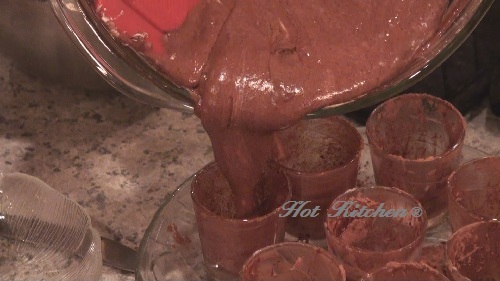 In a large bowl, over a pan of simmering water, melt the chocolate and remaining butter. Stir occasionally until smooth. Remove from heat and add the vanilla. Whisk in the yolks one at a time until smooth. Set aside. In a clean bowl, beat the egg whites with the sugar, salt, and cream of tartar until stiff (but not dry) peaks form. Gently fold the egg-white mixture into the chocolate. Spoon into the ramekins or shot glasses. Place them in another pan for easy handling. 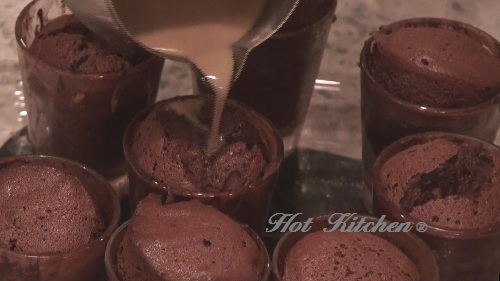 Hot Kitchen Touch – Drizzle the warm souffles with the cream liqueur right before spooning into your sweetie’s mouth! Tip: The recipe can be made to this point up to 1 day ahead. Cover with plastic wrap and refrigerate. Catch our latest show here or on ourHome Page or sub us on YouTube, Follow us onBlip, sub us on I Tunes, etc.